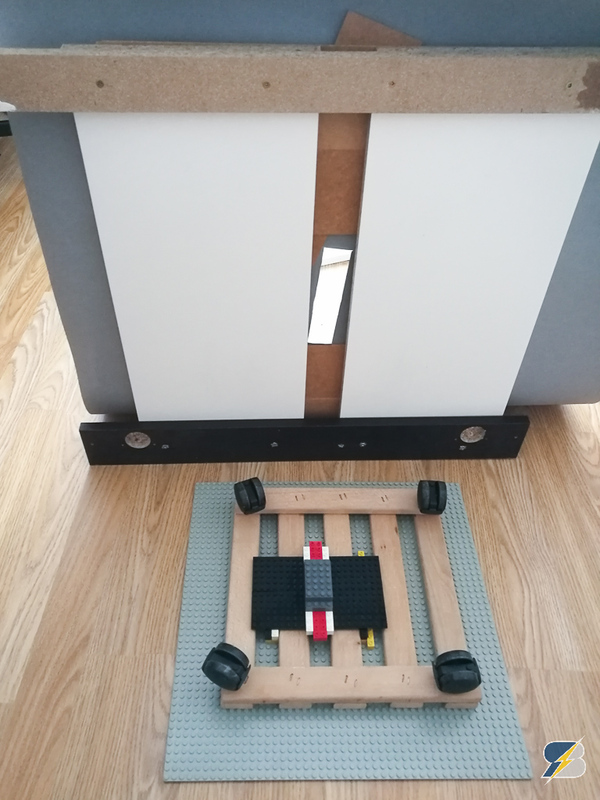 Since I received many requests again to provide instructions for the wheeled speed recorder Lego Technic 42069 Extreme Adventure RC mod, I try to help you and took a series of pictures while disassembling the model. Please note that this video is far from being a complete guide – it shows how to build the 2 axles with the 4 buggy motors. This is my third and last Lego 42069 Extreme Adventure remote control mod. After the Superleggera mod I did not plan to create another one but I was convinced by some comments on my YouTube channel (thanks for the tip!). Although I really liked 42069 on tracks, I realized that the top speed was limited by the construction so the 4 buggy motors could not show their full potential. 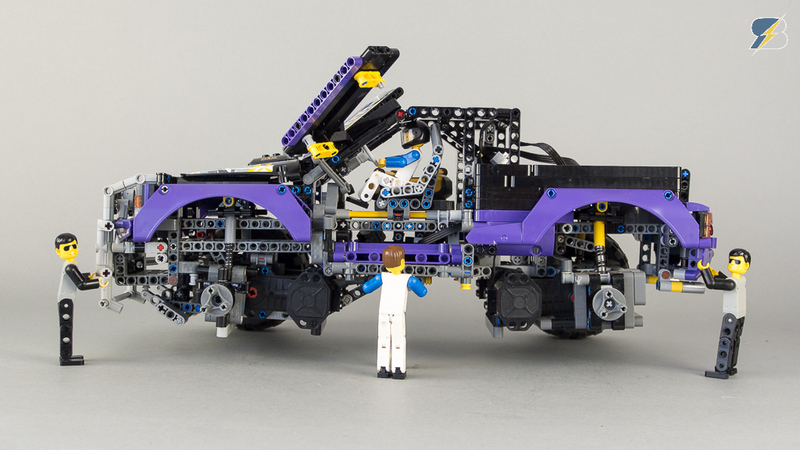 I removed the tracks and added the wheels from the 9398 Crawler set. The pickup-style body was kept from the previous mod to ensure the car is as light as possible. The axles were rebuilt completely to fit the buggy motors and the wheels. 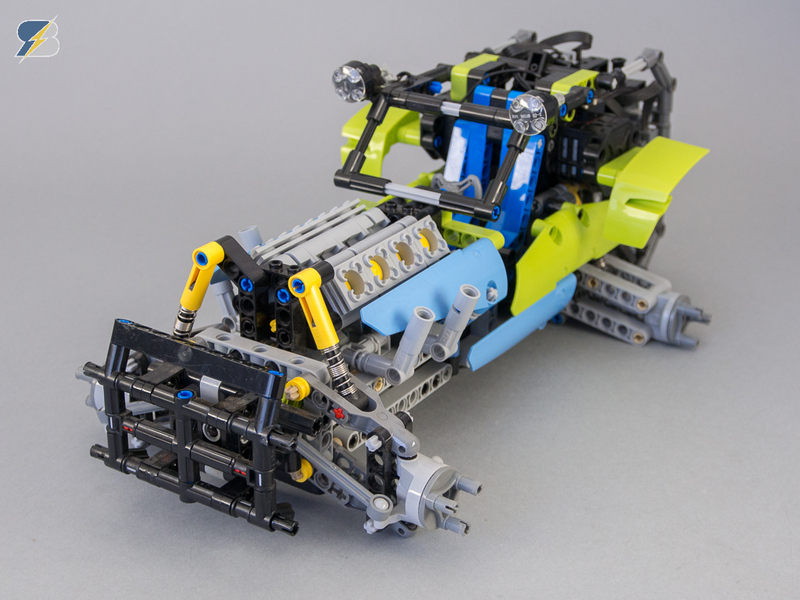 Lego Technic 42037 Formula Off-Roader upgraded for full remote control. Engine swapped, it has a V8 now. Driven by two buggy motors, powered by 2 BuWizz units. Steering with Power Functions Servo motor. Engine powered independently with a Power Functions M motor. Installed Power Functions Lights as well. Disclaimer – by clicking on the Ebay or Amazon links and purchasing the parts you contribute to my future projects and builds. As I don’t have the resources at the moment to create building instructions for this set and the changes are not that difficult, I think it is enough to share some detailed photos of the set without the body. I also took some photos of the two sets side-by-side to make the differences visible. 42050 Drag Racer upgrade – real wheelies!! The body panels and the stickers of the upgraded version are mostly coming from the 42041/8041 Race Truck, I think they fit perfectly. 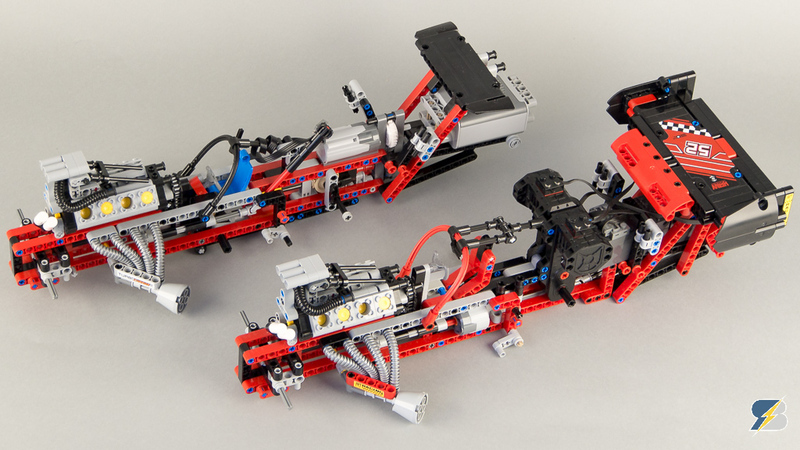 I created a separate video with the following setup – 2 buggy motors + BuWizz + SBrick and controlled with an Android-compatible game controller through the great SBrickController app of imurvai – you can find the link to the app in this Eurobricks forum thread.